The film follows Jackie Kennedy in the days when she was First Lady in the White House and her life immediately following the assassination of her husband, President John F. Kennedy, in 1963. It is partly based on Theodore H. White's Life magazine interview with the widow at Hyannis Port, Massachusetts in November 1963. The film was selected to compete for the Golden Lion at the 73rd Venice International Film Festival, and was released in the United States on December 2, 2016, by Fox Searchlight Pictures to positive reviews and was nominated for three Oscars at the 89th Academy Awards: Best Actress (Portman), Best Original Score and Best Costume Design. A week following the assassination of John F. Kennedy, a journalist visits Jacqueline Kennedy for an interview at her home in Hyannis Port regarding her husband's legacy. After Jackie reflects upon her 1961 televised tour of The White House, the journalist turns to inquiries about John F. Kennedy’s assassination and its aftermath for Jackie and her family. She talks about events shortly prior to the assassination, before describing her shock and horror in reaction. Members of the White House close to the newly sworn-in President Lyndon Johnson and his wife Lady Bird are seen comforting Jackie in the aftermath onboard Air Force One. Robert F. Kennedy soon appears and shares her grief, escorting her back to Washington. Jackie expresses her deep concern for the well-being of her children in adjusting to the loss of their father. Robert continues to support her whilst dealing with his own sadness, and helps her in planning the funeral and looking after the family. She is seen struggling to sleep and becoming reliant on medications and alcohol. She is also seen regularly seeking spiritual counsel from a priest. Robert Kennedy along with President Lyndon Johnson, Lady Bird Johnson and members of the White House witness Lee Harvey Oswald's murder on live television. Robert insists to all that Jackie not be informed of this by anyone but himself; he will tell her when he feels the time is right. However Jackie finds out about it almost immediately, and condemns him for withholding it from her. After John F. Kennedy Jr.'s 3rd birthday, Robert voices his fears to Jackie that Jack's short time as President will not be noted by future generations. After the State funeral of John F. Kennedy, Jackie tells the priest that she contemplated suicide following the assassination. She then admits that she clearly remembers what happened during the assassination and feels unbearable pain and guilt that she did not act in some way to protect her husband. As the interview ends, Jackie makes it clear to the journalist that she maintains the right to control which parts of the interview may come to press and which parts are to be withheld. The film concludes with Jackie having her miscarried and stillborn children's coffins being re-interred next to John F. Kennedy’s. Brody and Aiden Weinberg as John F. Kennedy Jr. The film's script, written by Noah Oppenheim, was originally conceived as an HBO miniseries, covering the "four days between John F. Kennedy's assassination and his burial, showing Jackie at both her most vulnerable and her most graceful". Steven Spielberg was originally set to produce the series, and later left the project. Pablo Larraín, not typically inclined to directing biopics, was initially hesitant to direct Jackie when he was offered the opportunity. He stated that although he did not have any history or knowledge about John F. Kennedy's assassination, he connected with Jacqueline Kennedy. Prior to directing Jackie, he had only made films centering on male protagonists rather than women. Thus, Jackie is the first film that he could approach from a woman's perspective. He grew more interested in Kennedy after learning more about her. To him, her life after the assassination "had all the elements that you need for a movie: rage, curiosity, and love." Oppenheim said that the screenplay itself did not change much over the long development process, revealing, "When Pablo Larraín boarded the project, he had ideas. I wrote two or three more drafts with his guidance, but over a very condensed period of time. So while it took six years from first draft to completion, most of those six years were not active years." In April 2010, it was announced that Rachel Weisz would star in the titular role, with Darren Aronofsky set to direct and produce the film, from Oppenheim's script. However, both Weisz and Aronofsky dropped out after they ended their romantic relationship. The same year, Steven Spielberg showed interest in helming the film. Then in September 2012, without a director, Fox Searchlight Pictures started courting Natalie Portman to star in the film as Jacqueline "Jackie" Kennedy, hoping that her participation would bring back Aronofsky, although Portman's involvement was contingent on which director signed on. At the 65th Berlin International Film Festival in February 2015, Pablo Larraín was approached by Aronofsky to direct the film, after he was impressed by the former's The Club. Larraín was skeptical, and asked Aronofsky why he wanted a Chilean man who was not fond of biopics to helm the film. In May 2015, Portman was confirmed to star in the film. That same month, Larraín was hired to direct the film, with Aronofsky working as a producer. By the 2015 Cannes Film Festival, the film was officially a go. The rest of the cast – led by Greta Gerwig and Peter Sarsgaard – were announced between May and October of the same year. Natalie Portman was approached to star in the film in September 2012, but her casting was not confirmed until May 2015. 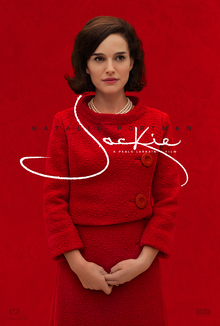 In preparation for the role, Portman studied Jackie Kennedy extensively by watching videos of her, repeatedly watching White House tour recordings, reading books, and listening to audiotapes of her interviews. She also read around twenty of her "pulpy" biographies, which she did not consider high literature. Her primary source was the seven-part eight-and-a-half-hour Life magazine interview conducted in the early part of 1964, by Arthur M. Schlesinger Jr. with Kennedy. One of three interviews she gave following her husband's assassination, it was kept private throughout her life. Portman said she was intimidated at first, and her initial knowledge of Kennedy was just a "superficial understanding of [Kennedy] as a fashion plate." But through playing her in the film, Portman gained a deeper understanding of the former first lady. While doing research, she found out that Kennedy had two personas in front of different people – a debutante in public but feisty behind closed doors. "When she was doing interviews, [her voice] was a lot more girly and soft, and then when you hear her talking to Schlesinger at home, you hear the ice in the glass clinking and the voice is a little deeper and her wit comes out more, so you get this real sense of the two sides." Mimicking Jackie's ranging vocals was pivotal for Portman, since Aronofsky said "conquering Kennedy's vocals was the key to the rest of the film." Portman trained with dialect coach Tanya Blumstein, and in the beginning, had difficulty with copying Kennedy's vocals, especially on the first day of set when her initial delivery was too much. She has also said that the costumes helped her to get into character. Portman is one of many actors to have portrayed Kennedy in cinema and on television, following Divine, Jaclyn Smith, Sarah Michelle Gellar, Roma Downey, Jill Hennessy, Joanne Whalley, Kat Steffens, Jacqueline Bisset, Jeanne Tripplehorn, Parker Posey, Blair Brown, Katie Holmes, Victoria Beckham, Ginnifer Goodwin, Stephanie Romanov and Minka Kelly. Principal photography on the film began in December 2015 in a Paris-area studio, where most of the interior scenes were shot. Production designer Rabasse and set decorator Melery oversaw replication of the White House rooms needed for filming in the studio just outside Paris. In February 2016, production moved to downtown Washington, D.C., where JFK's funeral procession scenes were filmed. Mica Levi composed the film's accompanying score. The film had its world premiere at the 73rd Venice International Film Festival on September 7, 2016. It also screened at the Toronto International Film Festival on September 11, 2016, winning the festival's Platform Prize. Shortly after, Fox Searchlight Pictures acquired U.S distribution rights to the film, and set it for a December 9, 2016, release. It was later moved up a week to December 2. Jackie was released on Blu-ray, DVD, and digital download by Fox Searchlight Pictures on March 7, 2017. Jackie grossed $14 million in the United States and Canada and $11.1 million in other territories for a worldwide total of $25.1 million. Fox Searchlight opened Jackie in a limited release in five theaters across the United States on December 2, 2016. In Los Angeles, it screened at the Arclight Hollywood and the Landmark West L.A., while in New York City, it played at AMC Lincoln Square, Cinema 1,2,3, and the Landmark Sunshine. It grossed $275,000 during its opening weekend (a per-theater average of $55,000), finishing 20th at the box office. Jackie received positive reviews from critics, with Portman's performance being widely acclaimed. On review aggregator website Rotten Tomatoes, the film has an approval rating of 88% based on 309 reviews, with an average rating of 7.9/10. The site's critical consensus reads, "Jackie offers an alluring peek into a beloved American public figure's private world — and an enthralling starring performance from Natalie Portman in the bargain." On Metacritic, the film has a score of 81 out of 100, based on 52 reviews, indicating "universal acclaim". David Rooney of The Hollywood Reporter gave the film a highly positive review, writing that the film is "Extraordinary in its piercing intimacy and lacerating in its sorrow." Guy Lodge of Variety also gave the film a highly positive review, writing that "Chilean helmer Pablo Larraín makes an extraordinary English-lingo debut with this daring, many-leveled portrait of history's favorite First Lady." Matt Zoller Seitz of RogerEbert.com, however, gave the film two-and-a-half out of four stars, criticizing the film's frame narrative and stating that it is "not ultimately necessary (few are, alas) because... we have already seen everything both of them might have had to say illustrated, in a more immediate and often wrenching way, by the flashbacks", which "constitute a second, far superior film, one that has the shock of revelation". The Dallas Morning News commentator Anna Parks criticized the film's negative portrayal of Jackie's relationship with Lyndon and Lady Bird Johnson. She noted that letters, as well as a taped phone conversation between President Johnson and Jackie, which occurred on December 2, 1963, showed that the former first lady and the Johnsons were cooperating well. ^ "Jackie (15)". British Board of Film Classification. November 16, 2016. Retrieved November 16, 2016. ^ "Venezia 73". Retrieved August 11, 2016. ^ Thompson, Anne (September 12, 2016). "How TIFF 2016 Rocked The Oscar Race: Why 'Moonlight' Glows, 'Birth' Struggles, and More Revelations". Indiewire.com. Retrieved September 12, 2016. ^ a b "Jackie (2016)". The Numbers. Retrieved May 2, 2017. ^ Rothman, Lily. "This Is the Real Jackie Interview With LIFE Magazine". Time.com. Time Magazine. Retrieved January 20, 2017. ^ Harris, Hunter. "The Real Story of the Life Magazine 'Camelot' Interview in Jackie". Vulture.com. New York Magazine. Retrieved January 20, 2017. ^ "Venice Film Festival 2016". Deadline. July 28, 2016. Retrieved July 28, 2016. ^ Wilkinson, Alissa. ""Politicians have always tried to sell a fairy tale": Jackie's screenwriter on the power of a well-crafted image". Vox. Retrieved March 23, 2017. ^ Jennifer Armstrong (March 16, 2010). "Steven Spielberg selling Jackie Kennedy Onassis script". Entertainment Weekly. Retrieved October 8, 2016. ^ Nicole Sperling (April 14, 2010). "Exclusive: Rachel Weisz to play Jackie Kennedy". Entertainment Weekly. Retrieved October 8, 2016. ^ a b c Malina Saval (October 13, 2016). "'Jackie' Director Pablo Larrain on the Kennedy's Story: 'Rage, Curiosity, and Love'". Variety. Retrieved October 13, 2016. ^ Christopher McKittrick (December 6, 2016). "The Different Faces of Jackie". Creative Screenwriting. Retrieved December 6, 2016. ^ Rich, Katey (April 14, 2010). "Rachel Weisz To Play Jackie Kennedy For Darren Aronofsky". Cinema Blend. Retrieved June 15, 2016. ^ Robinson, Joanna (May 14, 2015). "Natalie Portman Will Be the Latest Actress to Play Jackie Kennedy". Vanity Fair. Retrieved June 15, 2016. ^ Mike Fleming Jr (September 28, 2012). "Natalie Portman Courted To Play Jackie Kennedy In Fox Searchlight Drama". Deadline Hollywood. Retrieved October 8, 2016. ^ a b Fleming Jr, Mike (September 28, 2012). "Natalie Portman Courted To Play Jackie Kennedy In Fox Searchlight Drama". Deadline Hollywood. Retrieved June 15, 2016. ^ a b Joanna Robinson (May 14, 2015). "Natalie Portman Will Be the Latest Actress to Play Jackie Kennedy". Vanity Fair. Retrieved October 8, 2016. ^ a b c Anthony D'Alessandro (September 16, 2016). "Natalie Portman On 'Jackie': "She Took This Real Control Over Her Family's Story" – Toronto Studio". Deadline Hollywood. Retrieved October 8, 2016. ^ a b c Hopewell, John (May 14, 2015). "Natalie Portman to Star as Jacqueline Kennedy in New Drama (EXCLUSIVE)". Variety. Retrieved June 15, 2016. ^ Kroll, Justin (October 30, 2015). "Greta Gerwig Joins Natalie Portman in 'Jackie' (EXCLUSIVE)". Variety. Retrieved June 15, 2016. ^ Kroll, Justin (October 28, 2015). "Peter Sarsgaard to Play Robert Kennedy Opposite Natalie Portman in 'Jackie' (EXCLUSIVE)". Variety. Retrieved June 15, 2016. ^ Julie Miller (September 11, 2016). "Natalie Portman on Unlocking the Mystery of Jackie Kennedy". Vanity Fair. Retrieved October 8, 2016. ^ a b Jason Gurrrasio (September 14, 2016). "How Natalie Portman prepared for her Oscar-worthy performance as Jackie Kennedy". Business Insider. Retrieved October 9, 2016. ^ a b Jason Guerrasio (August 17, 2016). "Natalie Portman talks directing her first movie and why you'll never see her on social media". Business Insider. Retrieved October 9, 2016. ^ Kate Erbland (October 13, 2016). "'Jackie': Natalie Portman Explains How She Looked Past Her Own 'Common Perceptions' for Her Lauded Role". IndieWire. Retrieved October 14, 2016. ^ Joey Nolfi (September 11, 2016). "Natalie Portman explains the daunting task of portraying an icon in Jackie". Entertainment Weekly. Retrieved October 8, 2016. ^ Times Staff (September 11, 2016). "Natalie Portman on playing Jackie Kennedy: 'It was nice to approach her as a person rather than as an icon'". Los Angeles Times. Retrieved October 8, 2016. ^ Ashley Lee (October 13, 2016). "How Natalie Portman Adopted That "Very Particular" Voice for 'Jackie'". The Hollywood Reporter. Retrieved October 14, 2016. ^ Jennifer Drysdale (October 13, 2016). "EXCLUSIVE: Natalie Portman Admits Playing Jackie Kennedy Was 'Challenging,' Gushes About Hillary Clinton". Entertainment Tonight. Retrieved October 14, 2016. ^ Emily Heil (September 13, 2016). "Natalie Portman may be (finally) the Jackie Kennedy fans want". The Washington Post. Retrieved October 9, 2016. ^ Tartaglione, Nancy (December 16, 2015). "Natalie Portman As 'Jackie'; First Look As LD Entertainment & Bliss Media Board Biopic". Deadline. Retrieved December 17, 2015. ^ Stamp, Elizabeth (December 1, 2016). "How a Designer Re-created Camelot for the New Movie Jackie". Architectural Digest. Retrieved December 3, 2016. ^ Emily Heil (February 22, 2016). "Natalie Portman to film Kennedy funeral scene in D.C. for upcoming 'Jackie'". The Washington Post. Retrieved October 9, 2016. ^ "Mica Levi to Score Pablo Larrain's 'Jackie'". Film Music Reporter. August 11, 2016. Retrieved August 11, 2016. ^ "Jackie". 2016 Venice Film Festival. Archived from the original on September 6, 2016. Retrieved September 7, 2016. ^ "Jackie". Toronto International Film Festival. Retrieved September 7, 2016. ^ Setoodeh, Ramin. "Fox Searchlight Buys 'Jackie,' As Natalie Portman Enters the Oscars Race". Variety. Retrieved September 13, 2016. ^ Fleming Jr, Mike (September 13, 2016). "Fox Searchlight Buys Natalie Portman-Starrer 'Jackie' In Toronto; Sets Dec. 9 Release". Deadline Hollywood. Retrieved September 13, 2016. ^ "Jackie Blu-ray". Blu-Ray.com. February 2, 2017. Retrieved February 12, 2017. ^ Brian Brooks (December 2, 2016). "Natalie Portman Is First Lady in Oscar-Hopeful 'Jackie' – Specialty B.O. Preview". Deadline Hollywood. Retrieved December 3, 2016. ^ "'Moana' Keeps Fire Going In Chilly December Weekend; 'Manchester' & 'Jackie' Bask In Awards Season Rays". Deadline Hollywood. ^ "Jackie (2016)". Rotten Tomatoes. Fandango. Retrieved March 21, 2018. ^ "Jackie Reviews". Metacritic. CBS Interactive. Retrieved December 20, 2016. ^ Rooney, David (September 7, 2016). "'Jackie': Venice Review". The Hollywood Reporter. Retrieved December 29, 2016. ^ Lodge, Guy (September 7, 2016). "Film Review: 'Jackie'". Variety. Retrieved December 29, 2016. ^ Seitz, Matt Zoller (December 2, 2016). "Jackie Movie Review & Film Summary (2016)". RogerEbert.com. Ebert Digital LLC. Retrieved January 18, 2019. ^ Film fails to show the warmth of Jackie Kennedy and Lady Bird Johnson Dallas News. December 1, 2016. Retrieved January 7, 2017. ^ LBJ Presidential Library Retrieved January 7, 2017.